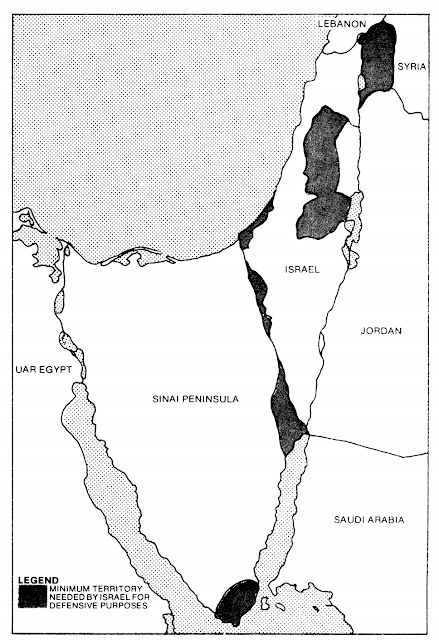 Here is a memo written by the US Joint Chiefs of Staff after the Six Day War where they describe which territory Israel must retain for peace. It was declassified in 1979. It is sort of amazing that this document has not received more publicity. There was an article detailing the full text in the Journal of Palestine Studies and Wall Street Journal had an article about this memo in 1983. 1. Reference is made to your memorandum, dated 19 June 1967, subject as above, which requested the views of the Joint Chiefs of Staff, without regard to political factors, on the minimum territory, in addition to that held on 4 June 1967, Israel might be justified in retaining in order to permit a more effective defense against possible conventional Arab attack and terrorist raids. a. The Jordanian West Bank. Control of the prominent high ground running north-south through the middle of West Jordan generally east of the main north-south highway along the axis Jenin-Nablus-Bira-Jerusalem and then southeast to a junction with the Dead Sea at the Wadi el Daraja would provide Israel with a militarily defensible border. The envisioned defensive line would run just east of Jerusalem; however, provision could be made for internationalization of the city without significant detriment to Israel's defensive posture. b. Syrian Territory Contiguous to Israel. Israel is particularly sensitive to the prevalence of terrorist raids and border incidents in this area. The presently occupied territory, the high ground running generally north-south on a line with Qunaitra about 15 miles inside the Syrian border, would give Israel control of the terrain which Syria has used effectively in harassing the border area. c. The Jerusalem-Latrun Area. See subparagraph 2a, above. d. The Gaza Strip. By occupying the Gaza Strip, Israel would trade approximately 45 miles of hostile border for eight. Configured as it is, the strip serves as a salient for introduction of Arab subversion and terrorism, and its retention would be to Israel's military advantage. e. The Negev-Sinai Border. Except for retention of the demilitarized zone around Al Awja and some territory for the protection of the port of Eilat, discussed below, continued occupation of the Sinai would present Israel with problems outweighing any military gains. f. The Negev-Jordan-Aqaba-Strait of Tiran Area. Israel's objectives here would be innocent passage through the Gulf of Aqaba and protection of its port of Eilat. Israel could occupy Sharm ash-Shaykh with considerable inconvenience but could rely on some form of internationalization to secure free access to the gulf. Failing this, Israel would require key terrain in the Sinai to protect its use of the Strait of Tiran. Eilat, situated at the apex of Israel's narrow southern tip, is vulnerable to direct ground action from Egyptian territory. Israel would lessen the threat by retention of a portion of the Sinai Peninsula south and east of the Wadi el Gerafi then east to an intersection with the Gulf of Aqaba at approximately 29^20' north latitude. 3. It is emphasized that the above conclusions, in accordance with your terms of reference, are based solely on military considerations from the Israeli point of view. b. Requirement. A boundary along the commanding terrain overlooking the Jordan River from the west could provide a shorter defense line. However, as a minimum, Israel would need a defense line generally along the axis Bardala-Tubas-Nablus-Bira-Jerusalem and then to the northern part of the Dead Sea. This line would widen the narrow portion of Israel and provide additional terrain for the defense of Tel Aviv. It would provide additional buffer for the air base at Beersheba. In addition, this line would give a portion of the foothills to Israel and avoid interdiction by artillery in the Israeli villages in the lowlands. This line would also provide a shorter defense line than the border of 4 June 1967 and would reduce the Jordanian salient into Israel. It also provides adequate lines of communications for lateral movement. Here is the map showing what that US defense experts felt Israel would need to maintain its defensive capabilities. Notice that the line is to the east even of today's Ariel. It is likely that this map is what the Americans had in mind when UNSC Resolution 242 was drafted, which insisted that Israel must be in "secure and recognized boundaries."